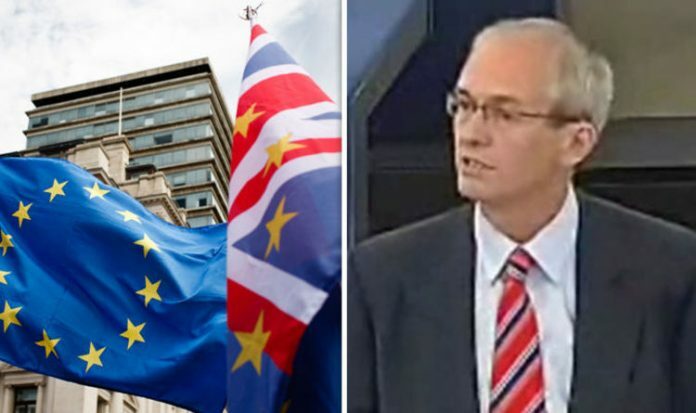 Richard Corbett, the Labour Party leader in the European Parliament, is on the ‘advisory committee’ for the People’s Vote, according to the Sun. The group produced a paper launched this week entitled “Roadmap to a People’s Vote” that said: “The die is not irrevocably cast, there is still time and, until the UK has left the EU, the Article 50 letter can be withdrawn”. The latest revelation comes after a cascade of other top Labour politicians appeared to either support or refuse to rule out a second referendum. On Sunday, London Mayor Sadiq Khan said: “After careful consideration, I’ve decided the people must get a final say. Shadow Brexit Secretary Keir Starmer described holding another vote as “an option”. Sir Keir Starmer has described Mr Corbett, who sits on Labour’s National Executive Committee, as “effectively a member of my shadow team”. Mr Corbett himself has claimed he is a de facto member of the Shadow Cabinet, helping to shape party policy, according to the Sun. The People’s Vote Remain group claims it has found six chances for Britain to have a vote on the final deal with the EU, but Prime Minister Theresa May has dismissed this as a possibility. She said “giving in” to calls for a second referendum would be a “gross betrayal of our democracy”. Conservative Deputy Chairman James Cleverly said: “Instead of trying to make Brexit a success, Labour only want to frustrate the process. “Re-running the referendum would take us al back to square one, and Labour must urgently rule out trying to delay Brexit. Brexit Secretary Dominic Raab on Wednesday wrote a letter to Labour demanding “urgent clarification” on their Brexit policy. Mr Starmer responded on Twitter only to say that that the letter was nothing more than a “gimmick”. Other Labour figures have recently softened their stance on Brexit including the leader Jeremy Corbyn, Shadow Chancellor John McDonnell and Deputy Leader Tom Watson. Mr Corbett was contacted for comment.